Watch the Northern Lights from an Aurora Cabin! Check-in: Northern Lights Village. 13 Dec Watch the Northern Lights from an Aurora Cabin! Check-in: Northern Lights Village. Lapland was a dream trip for us and really can you blame us? Another dream (which came true) was to watch the Northern Lights! Everything happened within six days in our winter trip to Finland. One of our most memorable moments in Lapland was our stay at the Northern Lights Village in Saariselkä, in the Arctic Circle. One of these places you will remember for your rest of your life! As promised, we will share everything with you and we hope that you will have the chance to stay in an aurora cabin and watch the Northern Lights too! How to get to Northern Lights Village and other useful information. Northern Lights Village is located in the village of Saariselkä. To get there you will need a flight from Helsinki to Ivalo Airport which is the closest airport. The distance from the airport to the resort is about 20 minutes. You can either rent a car or arrange a transfer through the hotel. The resort offers two kinds of “special” accommodation to spend extraordinary nights. Aurora cabins and Ice Suites. We spent our nights in an aurora cabin, which, as you can see, is also designed in such a way to be able to watch the Northern Lights from your bed (if you are lucky enough!). Extra info: The ice-suites and the hotel’s Ice Bar-restaurant are operating from mid-December until the weather permits it. Our aurora cabin (number 2) looked like a partial igloo made of wood! Half of it was glass so you could watch unobstructed the Arctic sky from your bed! Well, couldn’t ask for anything more than that to be honest. The rest cabin is wooden, so you can have your privacy as well . The aurora cabins are all 29 square meters so they are quite spacious, with a mini-bar and everything else you need. Also, at this point we have to say that not only the heating is excellent but also there is laser heating for the windows. As a result your windows are clear from the ice and you maximize your chances to watch Northern Lights. Smart, right?! Of course our favorite spot, in case it wasn’t clear enough was the bed of the view. Extra info: The cabin has hot water for about 10 minutes. So if two people want to shower the second one has to wait about the half an hour. However, it seemed very reasonable for us. And what do you do with the food ?! A reasonable question that many of you asked during this trip was where you eat when you stay in such a place. The resort is relatively isolated, near a forest, so they have taken into account that is not very easy to go far away in search for food. So, next to the reception is the buffet restaurant (from mid-December there is also the Ice bar – restaurant), where you can enjoy breakfast, lunch and dinner in a buffet style. We stayed in the aurora cabin 2 which was next to the forest at a distance of about 200 meters from the restaurant. There is a living room and a fireplace in the restaurant, so you can relax there with your book, or a glass of wine. Our breakfast was quite good! There was a decent variety of products and the tastes were satisfying too! The dinner buffet was not as satisfying, but it did the trick which was to take energy for the awesome activities that the resort offered us. Chasing the Northern Lights and other must-do activities. 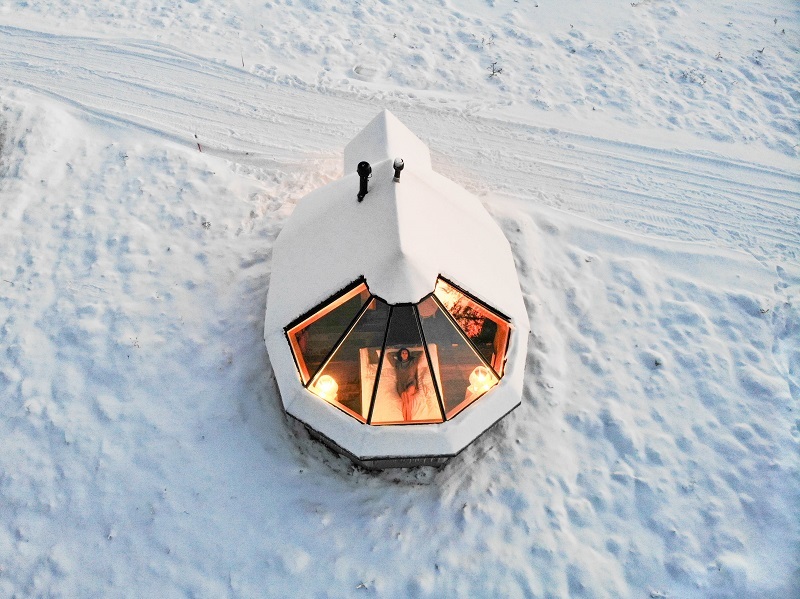 If it sounds boring to stay in an aurora cabin in snowy Lapland, we suggest you to not hurry! The Northern Lights Village offers many once in a lifetime activities, some of which we were fortunate to try out. Snowmobile tours in the woods and fishing in a frozen lake, hasky or reindeer rides, aurora hunting to the Russian border and much more. We had the opportunity to experience our own adventure driving a sleigh with huskies and learn things about those wonderful and energetic creatures. Of course our adventure did not end there! Our last night in Lapland we went to the Russian border and finally had the chance to watch the Northern Lights! What a unique experience..! Tip: High season for Lapland is the winter months, as the snowy landscape is magical. And don’t forget that after all this is the “home” of Santa Claus. Also, during winter you can watch the Northern Lights if you ae lucky enough! For more information you can contact the hotel. We were guests at Northern Lights Village, and this is a review based on our personal opinion and experience as always. We want to thank the hotel and the personnel for the warm hospitality!